Republican Florida Sen. Marco Rubio said that it was not "God's plan" for him to become president after he suspended his campaign Tuesday night, but urged the conservative movement to focus on its strong Judeo Christian values. "While it is not God's plan that I be president in 2016 or maybe ever, and while today my campaign is suspended, the fact that I've even come this far is evidence of how special America truly is, and all the reason more why we must do all we can to ensure that this nation remains a special place," Rubio said in his concession speech after losing the Florida primary to GOP frontrunner Donald Trump. While Rubio gathered 27 percent of the vote in his home state, Trump sweeped all 99 delegates in the winner-take-all primary, effectively ending Rubio's hopes of catching up to the billionaire businessman. The 44-year-old Senator, who has talked about his Christian faith throughout his campaign, gave thanks to God in his speech Tuesday night. "He has a plan for every one of our lives. Everything that comes from God is good. God is perfect. God makes no mistakes. And He has things planned for all of us," he added. "Yours O Lord is the greatness and the power and the glory and the victory and the majesty, indeed everything that is in the heavens and the earth. Yours is the dominion, O Lord, and you exalt yourself as head overall. Both riches and honor come from you and you rule over all. And in your hand is power and might and it lies in your hand to make great and to strengthen everyone." Rubio said that America needs a "vibrant conservative movement," but one that is built on principles and ideas, not on "fear, anger, or preying on people's frustrations." "A conservative moment that believes in the principles of our constitution. That protects our rights and limits the power of government. A conservative movement committed to the cause of free enterprise, the only economic model where everyone can climb without anyone falling," he continued. "A conservative movement that believes in a strong national defense and a conservative movement that believes in the strong Judeo-Christian values that were the formation of our nation." Rubio said that despite his disappointment in dropping out, he remains hopeful for America's future. "I take great comfort in the ancient words that teach us, that it is not human kind that directs our steps, but the Lord that directs our steps. I still remain hopeful and optimistic about America," he stated. He further asked Americans to refuse to give in to fear and to frustration. 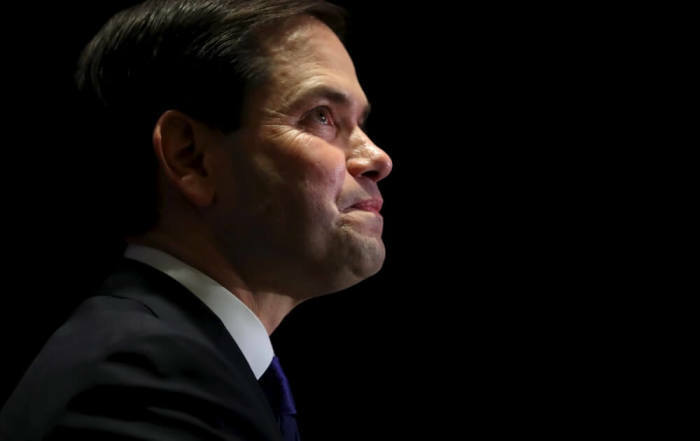 "We can disagree about public policy, we can disagree about it vibrantly, passionately, but we are a hopeful people, and we have every right to be hopeful," Rubio added. "May God strengthen our nation. May God strengthen the conservative movement. May God strengthen the Republican Party. May God strengthen our eventual nominee, and may God always bless and strengthen this great nation, the United States of America," he concluded. Texas Sen. Ted Cruz and Ohio Governor John Kasich, who have now both won their respective states, remain the only challengers to Trump, who won Florida, Illinois, and North Carolina on Tuesday, with the race in Missouri still too close to call.